The Grand Canyon is an awe-inspiring, profound and transformative place. It is such an epic happening, you can just dissolve into it and not really want to return to civilization. This trip was so much more than what I was expecting. It is one of those ineffable happenings in life that just needs to be experienced and cannot be completely expressed in words. It is nothing short of religious. Definitely one of the best trips I have ever been on among not a small number of travels. This one will stick in my heart. 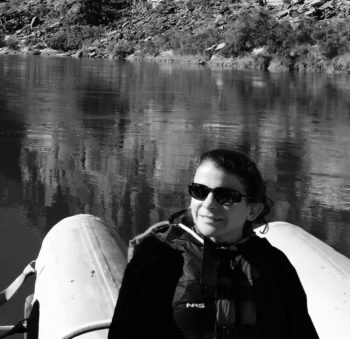 I am already missing it and dreaming about my next trip down the Colorado River. 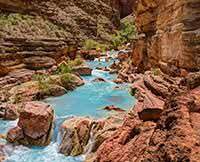 Some of the highlights for me were the Little Colorado River, Deer Creek and Havasupai. The stars at night were truly amazing, especially on the night we camped in “deep shade,” when the Grand Canyon walls blocked our moonlight and we saw it peeking out dramatically around a bend in the river. I also enjoyed the helicopter ride to Bar 10 Ranch at the end and that fantastic hot shower. Every detail of this trip is perfectly planned, from the moment the guides meet you at Marble Canyon to your ascent to Bar 10 Ranch. All four of our guides, Corey, Macky, Justin and Marty, were extremely helpful, hard working, knowledgeable and experienced. These guys were seriously amazing! I think they had literally hundreds of trips into the Grand Canyon between the four of them. Their skill and expertise demonstrated itself in everything they do. The logistics were impeccable. The food they prepared for us were delicious, gourmet meals. The guides were approachable and willing to lend a hand anytime someone needed assistance or had a question. They took care of us with the greatest kindness and care. Above all I was impressed with their knowledge of and passion for the canyon. It made our trip all the more incredible because that enthusiasm seeped into all of us and made the journey something genuinely special. I was expecting just another vacation, but what I received was an awe-some adventure that is truly a life changing experience. Our guides really helped us to experience that awesomeness. Finally, you should know you do not need to be an experienced camper or outdoors(wo)man to enjoy this trip. They take care of everything for you. All I had to worry about were my personal belongings and myself. You should not worry if you are not experienced as the guides provide everything you need. Western River has planned out every detail and they have truly exceptional, talented people working for them. The only thing I would change next time is to do the 7-day trip instead of the 6-day because I was really sad to leave at the end.